Bonggamom Finds: Go, Go, GOShredder! Out with the old, in with the new.... January is always a time to clean out old papers from our filing cabinet. 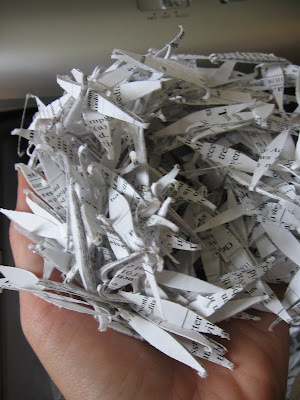 With the risk of identity theft, we're very careful about shredding our personal documents, but I'm all torn up (pun intended) about our current shredder. It's a pain to take in and out of the storage box because the shredder keeps coming off the wastebasket part. It also overheats pretty quickly, after about 30 minutes of shredding, and we need to let it cool down before starting it up again. So when Office Max offered to let me have a go (pun intented) at their new portable GoShredder, I jumped at the chance. The two words that come to mind when looking at the GoShredder are "cube" and "cute", so it definitely passes the coolness test. But would it perform? Surprisingly, it did! The paper is shred into diamond-shaped bits, so there's no hope of anyone stealing the scraps from our recycling bin and pieceing the documents back together gether any of the documents (I believe that would be Security Level 3). The shreds fall into a drawer beneath the shredding mechanism; when the drawer is full (it seems to hold about 70 sheets worth of shredded paper, a surprisingly large amount!) simply empty it into your recycling bin. The good: Because of its compact size, light weight and carry handle, it's easy to take out of storage, use, and put back in place (important for lazy people like me). The bad: Shredding capacity is closer to 6 sheets of paper at a time, not 8. Which is not a problem if you only use it for occasional shredding, not if you're trying to hide evidence of fraud or something. 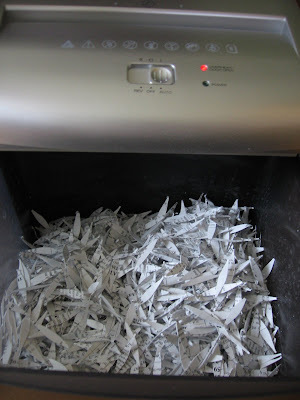 The bongga: The boys and I shredded files like nobody's business (I emptied the bin 4 or 5 times over the course of about an hour), and the machine didn't overheat at all. And I love, love, love the carrying handle. The final verdict: It's wonderful for light, occasional document shredding. I was impressed! Win a box of Girl Scout Cookies! Jump for joy at Pump It Up Jr!